Golf may not be the most popular sport in the Britain, but it is certainly one that catches the attention of the betting or the gambling community in the UK. Betting on golf is one of the more popular forms of gambling activities in the UK, and given how unpredictable golf can most of the times, golf betting makes for some exhilarating rounds of betting. Golf betting is a form of gambling based entertainment that has been in existence for nearly as long as the game itself. Besides the thrill of unpredictably and a ton of amusement, golf betting offers tempting prizes for successful bettors which makes the betting even more alluring for the common man. You do not have to be an experienced bettor to get involved with golf betting, but it is advisable that you follow the game of golf before making predictions about the outcomes of golfing events around the world. The more you know about the game, the better will be your chances of making accurate predictions. The higher your accuracy is, the richer will be your rewards. If you are really good with your golf predictions, you may end up making just as much as a PGA golfer makes by simply getting yourself engaged in golf betting in the UK. Golf betting is a rather broad term that can be used to refer to more than one kind of betting in this field. There are different kinds of golf betting options available to players around the world, especially those in the United Kingdom, with some of the versions of the betting being more popular than the other ones. Here are the three most commonly participated forms of golf betting in the world. This is the golf betting option that you are likely to run into as a beginner. It also happens to be the most talked about golf betting in most gambling communities in the world. In three balls betting, three players are required to compete against each other in a round of golf. For example, you can have Jim Furyk, Rory Mcllroy and Bubba Watson battling out against each other in a three balls bet for the first round of the Open Championship. All the three players will be priced with their individual odds. Your task, as the bettor, is to pick the player that you will feel perform the best among the three. The amount of money that you are willing to bet on a specific player is flexible. The only way for you to retrieve your money and earn some winnings is by having your player put in the best performance out of the three. Your payout will be multiplied by the odds with which your player was priced. Tournament match bets can be seen as a simpler version of the aforementioned game, three balls betting. The two forms of golf betting are quite similar in nature with the difference being that in tournament match bets, the betting option sets up “virtual” matches between any two players who are competing in a golfing tournament. Your job as the bettor is once again quite simple. All you have to do is select the player that you will accomplish the most in the tournament and come out with the higher score. If you do not see either player coming out on top, then you are allowed to place your bet on a draw and watch the desired outcome unfold. An example of a tournament match may see Tiger Woods being pitted against Jason Day. 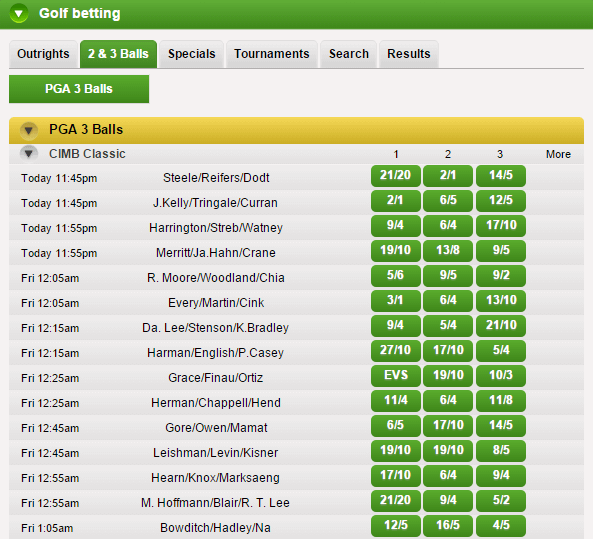 Similar to three balls betting, the individual players will be priced with their own individual odds. There will also be odds placed on the possibility of a draw. In other words, the draw here plays the role of a third golfer with his or her odds of winning the tournament. 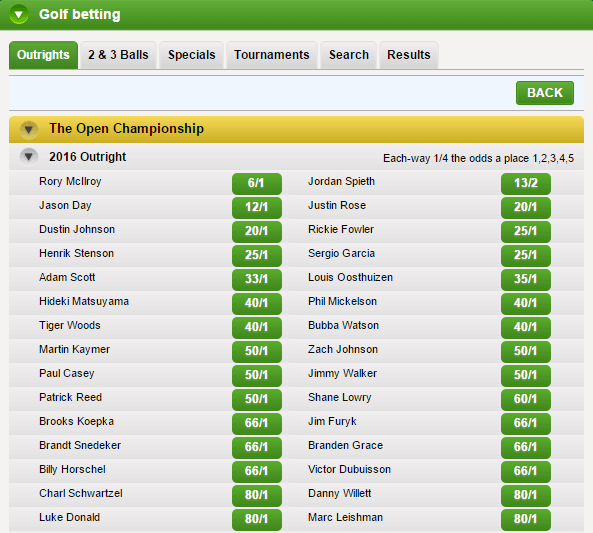 Golf betting options cannot get any simpler than this. You do not have to worry about a group or couple of players being stacked against each other to compete. All you need to worry about is picking a single player that you feel has the potential to win the upcoming major golf tournament. The task of selecting one player may be quite simple, but there is a lot of things that you need to take into account before making your pick among the dozens of participating golfers. One of the reasons why betting on a single outright winner is so popular, especially in the United Kingdom, is because it allows you to bet months in advance and at extremely high odds that turn out to be hugely rewarding. If you want to get involved with golf betting, then the first thing that you need to do is familiarize yourself with the websites that offer golf betting tips in the UK. Fortunately, there are plenty of such websites available, each with its own unique insight of how to master the art of golf betting. That being said, most golf betting websites which offer invaluable information and tips will provide the two following common pieces of advice. If you truly want an inside scoop of how well a player will perform on any given tournament, then you must spend your time researching huge piles of statistical data concerning the player. Do not just skim over the wins and losses. Dig deep into the information about the player’s style of play, his or her strengths, weaknesses, conversation rates etc. It is a well known fact that certain players perform considerably better under certain conditions or certain event courses. For example, American golfers have always been known to excel in the US Open as opposed to other majors throughout the year. By learning about the history of players, you can develop a much clearer idea about whom to bet on and when to bet. If you are looking for the best golf betting tips in the UK, then check out websites such as golfbettingsystem.co.uk, betting.betfair.com and golfbettingtips.co.uk where you will come across priceless expert’s opinions on how to get the most out of your golf betting experience.